That Wasn’t a Preview of the ALDS, Was It? There were few people who believed Zvonareva could overthrow Clijsters, but after her flawless ball striking and clever point construction in the match against Wozniacki, it seemed plausible to think there might at least be some contention. But from the moment Clijsters broke serve early in the first set, it was a downward spiral for Zvonareva. In only her second Slam final, she looked mortified of failure on such a significant stage. Her dread forced her to make far too many errors in the face of an opponent aggressively dictating play with cleanly hit groundstrokes. Even when Zvonareva seemed to be momentarily reinvigorated and played a point possessed, Clijsters broke out her impenetrable defense; she tracked down numerous near-winners with her signature splits and incomprehensible slides on hard pavement, until Zvonareva flinched and hit long or dumped the ball into the net. She couldn't gain ground even when she seemed to be thinking clearly. But that wasn't too often anyway. Although there were no histrionics like last year's fourth-round defeat (in which Zvonareva viciously hit herself and sobbed in the middle of the match), she was emotionally and physically paralyzed by the situation. 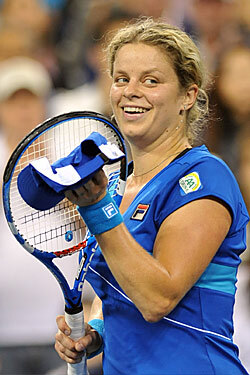 And as sweet as Kimmy Clijsters can be, she showed Zvonareva no mercy until the trophy was firmly in hand. The match lasted all of 59 minutes, making it the shortest U.S. Open women's final on record since the tournament began timing matches 30 years ago. Clijsters certainly deserved the title — she's now logged 21 consecutive U.S. Open match wins — but it was a mauling that seemed better suited to an earlier round, not a Grand Slam final. It's understandable why the tennis community put the cart before the horse: Djokovic has been playing blasé, uninspired tennis for most of the season, and he came excruciatingly close to losing in the first round at this very tournament. But Djokovic skillfully fought Federer with an intensity he hasn't exhibited in quite some time. While facing two match points in the fifth set, Djokovic saved his skin by hitting risky forehands so wickedly hard and deep, he brought the stadium to its feet in awe and admiration. He came into this Slam largely written off, and it's possible that flying completely under the radar allowed him to orchestrate what many are already calling a classic upset. The men's final on Sunday was washed out and is rescheduled for today at 4 p.m., and for Djokovic, it's a blessing. He played a nearly four-hour match Saturday evening, while his opponent, Rafael Nadal, quickly finished earlier that afternoon and hasn't dropped a set during the entire tournament. If the final took place on Sunday, Djokovic would have had less than 24 hours to recover, and when you're faced with the most physically ripped player on the tour, you need every ounce of strength you can keep in reserve. With an extra day of rest for Djokovic, and with his psychological high of taking out an in-form Federer, it's a safe bet that his face-off with Nadal will be more competitive than the Clijsters blowout. Here's hoping.